Sometimes less is more. Isn’t it frustrating when the cliches are right? But with this card, I kept it really simple, and I think that’s the elegance of it. I wanted to do some heat embossing, but I didn’t want to go overboard with it, I just wanted to strip it right back to bare bones, and let the shine of the embossing do the work. So I’ve basically cut a standard card based, lined it inside with Pool Party cardstock and added a mat of Basic Black cardstock to the front. 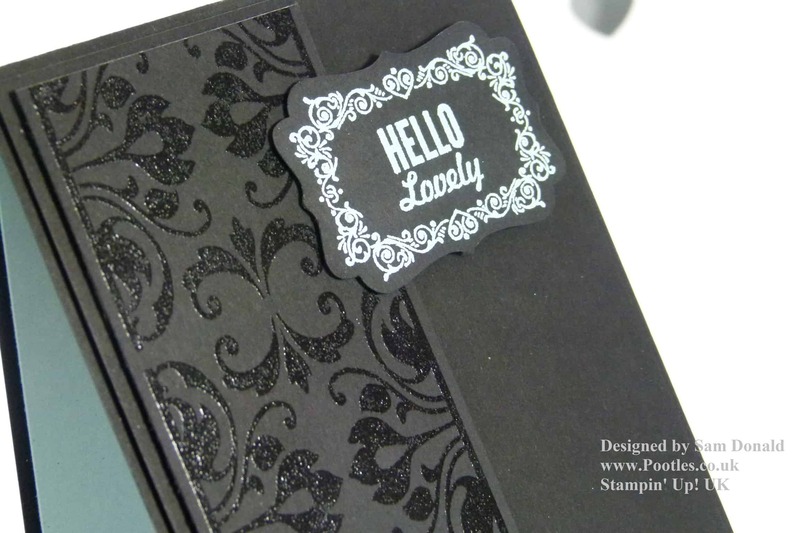 After that, I simply used my Daydream Jumbo Wheel stamp and embossed it using Black embossing powder, onto a narrow strip of Basic Black Cardstock. I could have used clear embossing powder, but I wanted just a little more ‘depth’ to this. Finally, my favourite phrase in the world is ‘Hello Lovely’ and I say it all the time. I’ll often reply to comments here with that too! But we have a fantastic set called Hello Lovely, so I could only use that one couldn’t I? 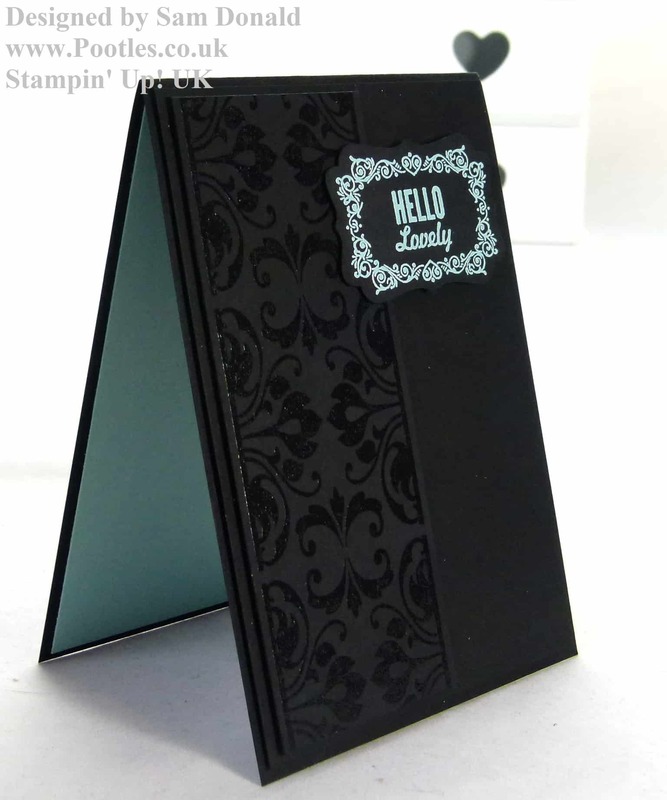 And again, stamping it onto Basic Black Cardstock with versamark ink, I’ve heat embossed this one using Pool Party embossing powder and then cut it out using the Decorative Label Punch. I do have plans for similarly styled cards, but they’ll be variations on a theme! And of course, my question for the day is….. Do you have a signature ‘catch phrase’ that you use? I say Hello Lovely mostly, but I also say ‘ooooooo’ a lot too. Mostly in the written format! « Stampin’ Up! UK Craft Classes – the Dates are IN!